← Excuse Me, But There’s a Chihuahua in my Turkey ! Music – “Closing Theme/Commercial – Kraft Cheese/NBC Theme” from Bing Crosby Kraft Shows, Vol 1 by Bing Crosby. That’s right. You know the guy, who built a big wooden ark and filled it with two of every known animal. Well, according to The N.K. Fairbank Company, manufacturers of “Cottolene” shortening, “Noah was the founder of indigestion – He forgot to leave the pigs ashore”. At least, that’s what their ad in the November, 1906 issue of “Table Talk” proclaims. Ad in the November, 1906 issue of “Table Talk”, hailing the merits of “Cottolene” shortening. 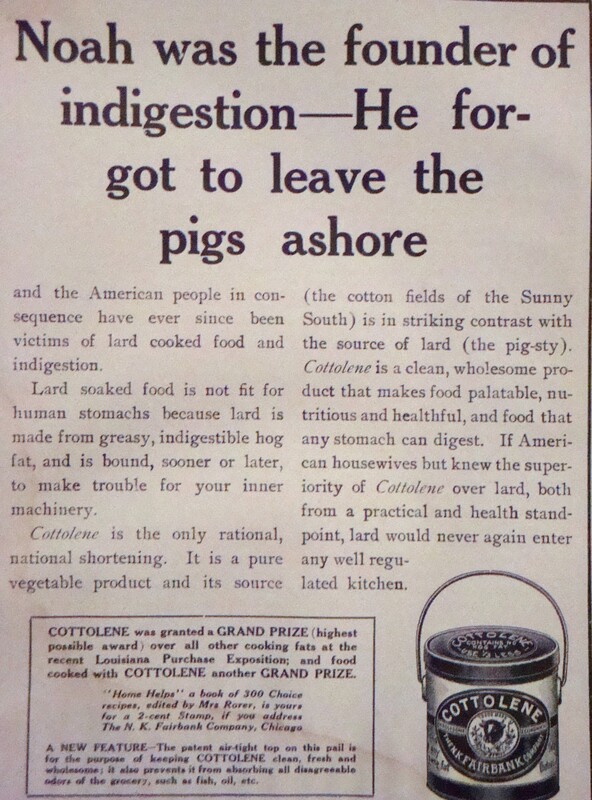 They espouse “Cottolene” as the “…only rational, national shortening”, pointing out that “Lard soaked food is not fit for human stomachs because lard is made from greasy, indigestible hog fat, and is bound, sooner or later, to make trouble for your inner machinery”. Well, if that doesn’t make you swear off pig fat, I don’t know what will. Vintage manufacture’s cookbooklets and pamphlets are a wonderful and often amusing source of food ads, which are miniature time capsules about food history and trends. Looking through some of mine recently, I found a number of ads, which I would like to share with you for your amusement and delight. 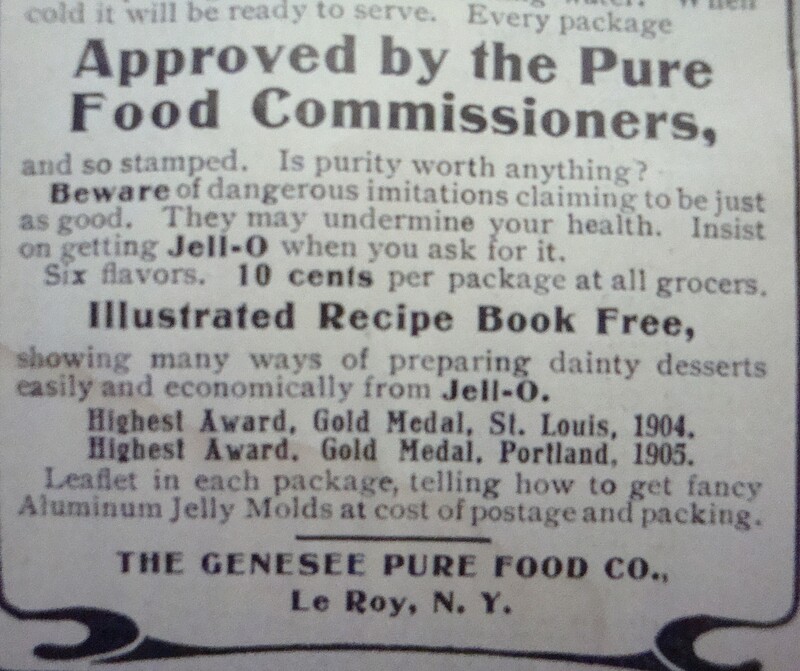 In the same November, 1906 issue of “Table Talk”, there are ads for “Jell-O” from The Genesee Pure Food Co., proudly noting that every package of Jell-O is “Approved by the Pure Food Commissioners” (aka Food Police and probably the forerunner of the Federal Food and Drug Administration). 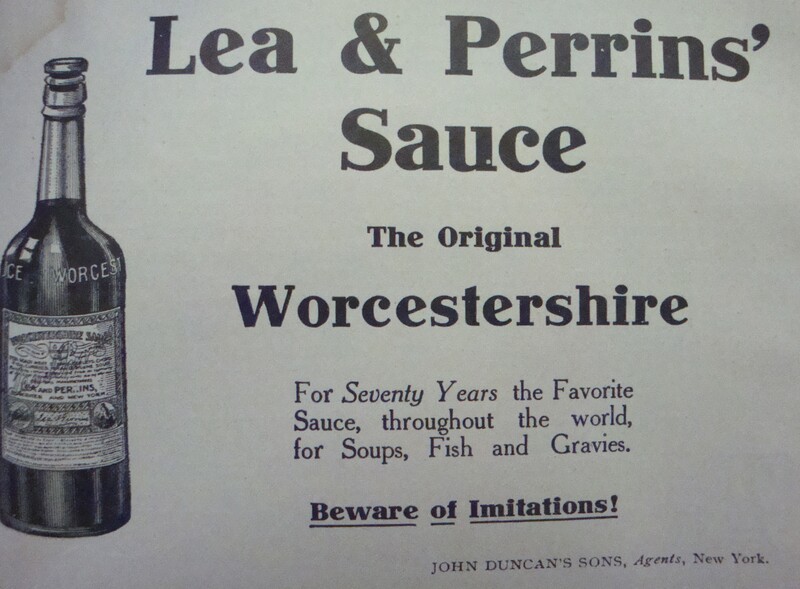 The ad points out to the purchaser to “Beware of dangerous imitations claiming to be just as good. They may undermine your health”. In 1903, James Lewis (J.L.) Kraft rented a horse and wagon, purchased wholesale cheese and began selling it to small stores in Chicago. By 1924, sales had expanded and an office was opened in London. The name was changed to “Kraft Cheese Company”. In 1928, they merged with Phenix Cheese Corporation to become “Kraft-Phenix Cheese Corporation. Over the years many products were manufactured under the name of “Kraft-Phenix” and a lovely booklet entitled “Kitchen Fresh Ideas” by Marye Dahnke, Director of the Home Economics Kitchen for Kraft-Phenix Cheese Corporation was published in 1931. 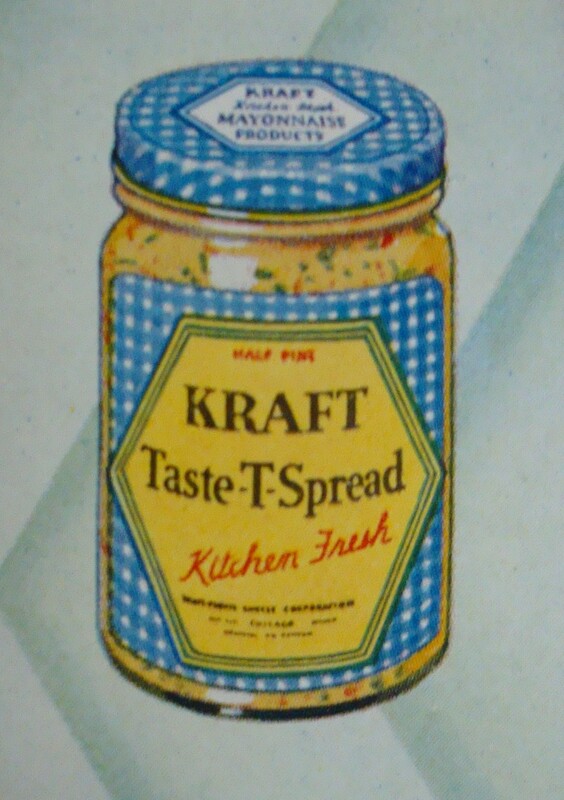 In addition to the recipes were a number of colour illustrations of some of the products including “Kraft Taste-T-Spread” and “Kraft Ham-N-aise”. 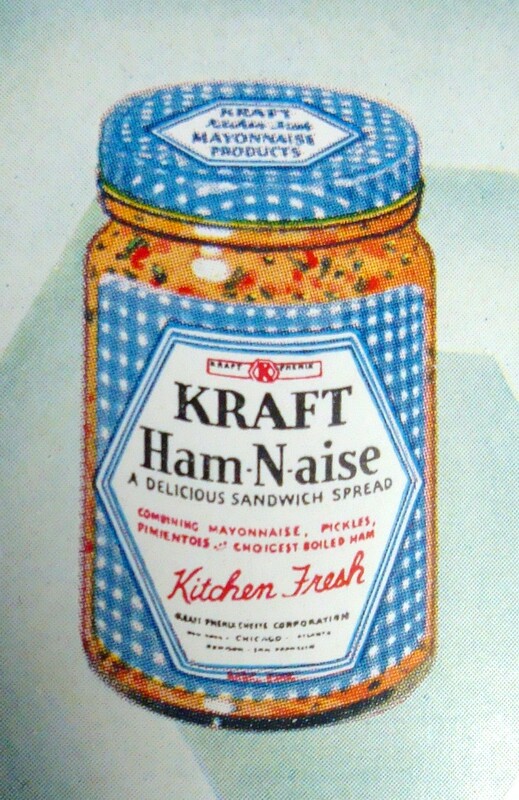 A trademark for “Kraft Ham-N-aise” was filed on August 28th, 1930. According to http://www.legalforce.com, the product was a sandwich spread combining mayonnaise, pickles, pimentos, and “choicest” boiled ham. The trademark expired November 3rd, 1992, and presumably is no longer manufactured. 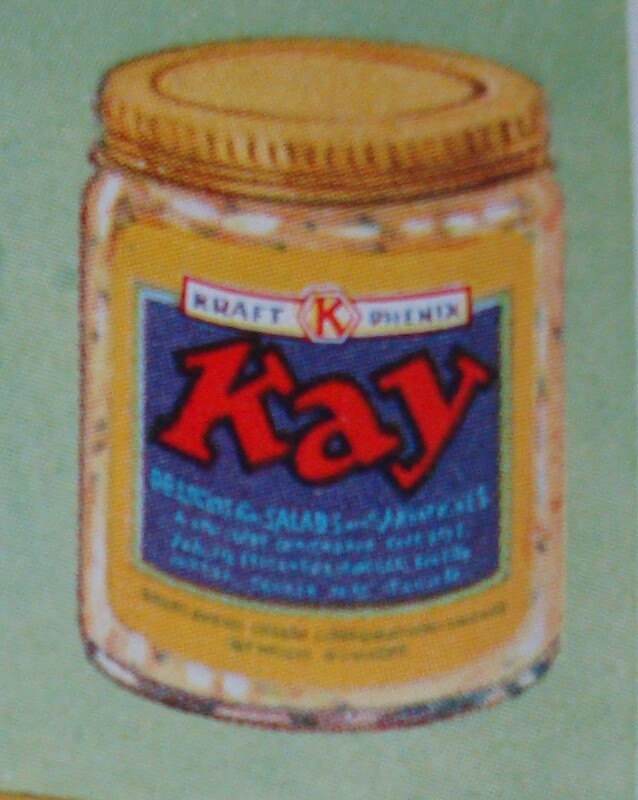 Another Kraft-Phenix cheese product was “Kay”, also a spread for appetizers and probably manufactured around the same time. I’ve never tasted any of the three products, but I suspect they have been supplanted by similar products, with benefit of a name change. Kraft-Phenix also published a small pamphlet, “Appetite Tempters from the Kraft Kitchen”, and although undated, is probably circa 1940’s. 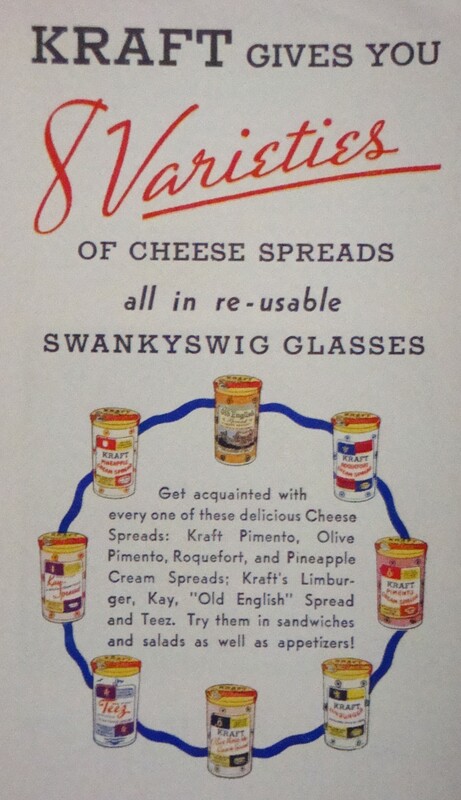 An ad inside indicates that Kraft gives you 8 varieties of cheese spreads, all in “re-usable swankyswig glasses”. I’m not sure what a re-usable “swankyswig glass” is. Just think of drinking a nice rye and ginger with an underlying hint of “Pineapple Cream Spread”. Others included “Kay – A Relish Cream Spread”, “Teez – A Delicious Cream Cheese Savoury”, “Olive Pimento Cream Spread”, “Limburger Pasteurized Process Cheese”, “Pimento Cream Spread”, “Roquefort Cream Spread”, and “Old English Spread”. Anyone out there have a collection of “Swankyswig Glasses”? “Culinary Wrinkles” was published by Armour & Company of Chicago in 1903 and features recipes using their meat extracts. In addition to their beef extracts, there are recipes using “Asparox”, which consists of “selected” asparagus juice concentrated and Armour’s Extract of Beef”. Who thought up that combination? The W.T. 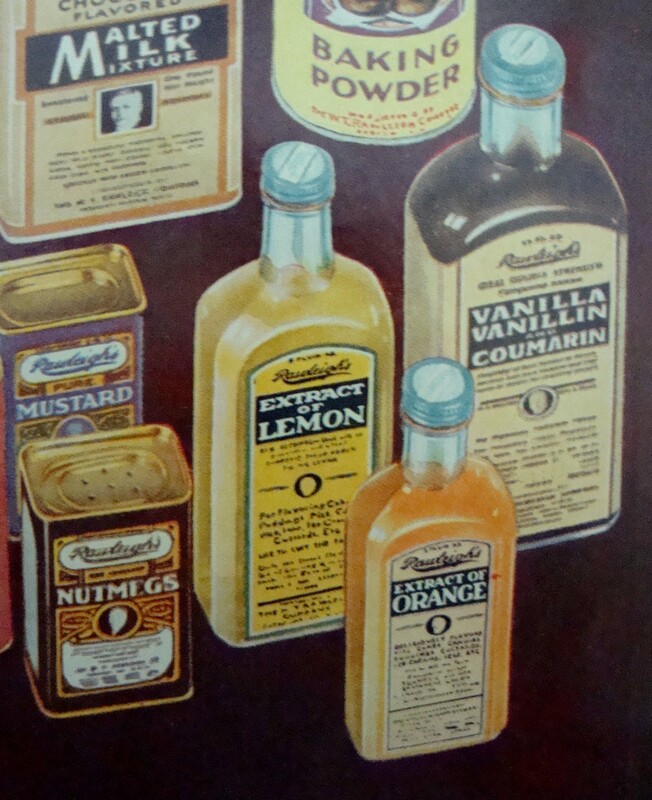 Rawleigh company has been around since 1889 and manufacturers a variety of products from sauces, extracts, flavourings, to cough syrup, salves, pills and products to protect your cows from insects to machine oil to “poultry powder”. The 1937 issue of “Rawleigh’s Good Health Guide Almanac & Cook Book” features a number of lovely illustrations of their products. I was particularly interested in their extracts and flavourings. The illustration of “Rawleigh’s Extract of Lemon” indicates a percentage of alcohol (the label is too small to read the quantity), and I was intrigued. However, when researching this a little, I discovered that even contemporary lemon extracts (not flavourings) contain significant amounts of alcohol. According to some reviews, McCormick “Pure Lemon Extract” contains 83% alcohol and other brands contain similar amounts. Because such small amounts of extracts are used in cooking, it is unlikely that a tart baker would be tipsy in sampling the batter. Should you choose to quaff down the entire bottle (usually anywhere from 3 to 6 ounce bottles), you’d probably get a good burning in your mouth and throat from the concentration of the alcohol. Not recommended. In addition to the Extract of Lemon, I noticed the bottle of “Vanilla Vanillin with Coumarin”, which surprised me. Coumarin is a chemical compound, which is found naturally in some plants, although it can be synthetically produced as well. It has a distinctive odor, which has led people to use it as a food additive. According to some websites, it may have negative effects on the liver and kidneys and its use is restricted. In pharmaceutical use, it is used as a blood thinner, and the best known one is “Warfarin”, which goes under the brand name “Coumadin”, an anticoagulant. It is thought to taste faintly like vanilla. In the Furst-McNess Company booklet, “F. W. McNess’ Cook Book”, undated, but thought to have been published in the early 1920’s, there is an ad for F.W. 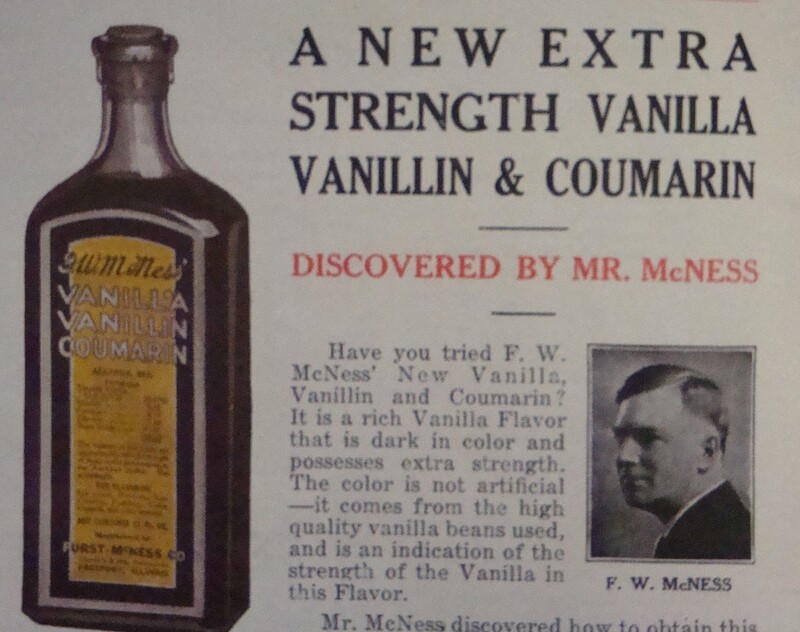 McNess’s own version of “Extra Strength Vanilla Vanillin & Coumarin”. When was the last time the spice man came to your door, like the Fuller Brush Man or the Avon Lady? 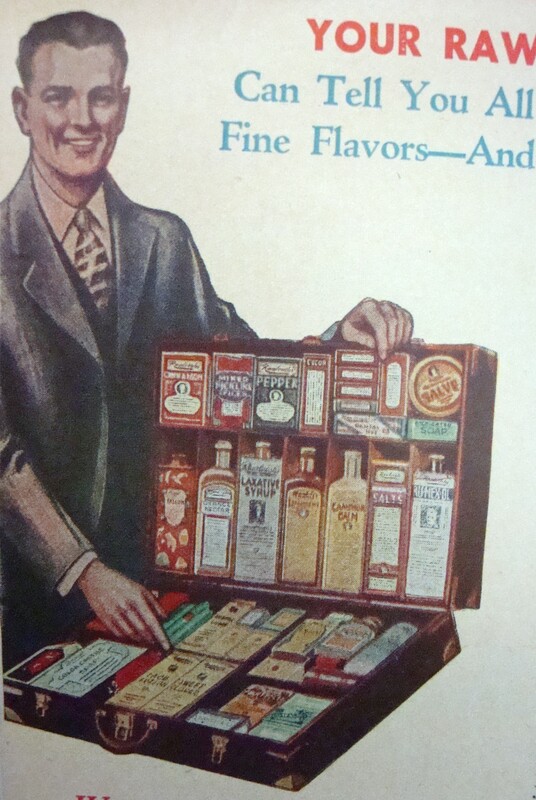 Well, at least in 1937, a Rawleigh’s dealer could call at your home to show you his suitcase full of fine wares including spices, oils, extracts, creams and lotions. Can you remember writing The Jell-O Company and receiving a 48-page booklet entitled “Jell-O Secrets for the Automatic Refrigerator” (is there any other kind? 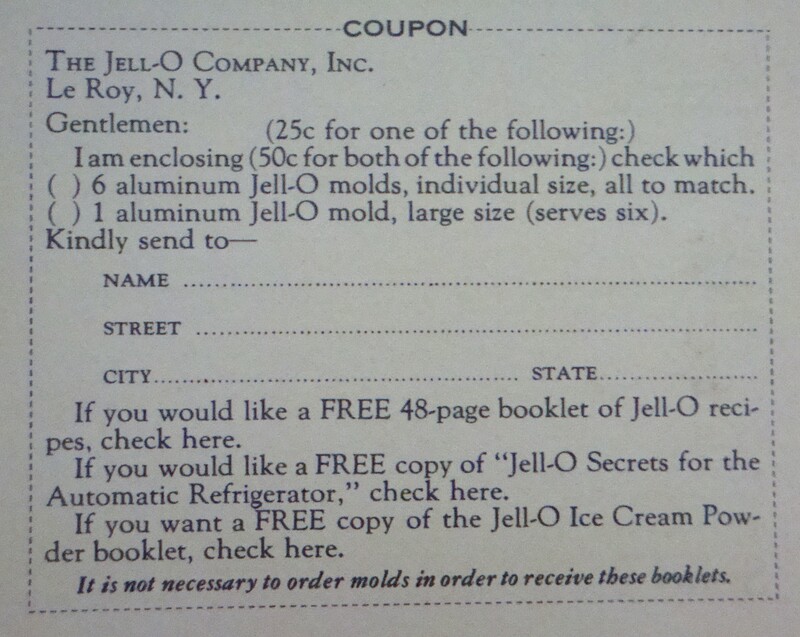 ), a copy of the Jell-O Ice Cream Powder booklet, PLUS 6 aluminum Jell-O molds (individual size), all for the grand sum of $.25? Ah, the good old days. Coupon from the back of “Quick Easy Jell-O Wonder Dishes”, 1930. Such a deal! Sealtest published “Sealtest Food Adviser”, for March and April, 1946, chock full of healthy recipes using their products. 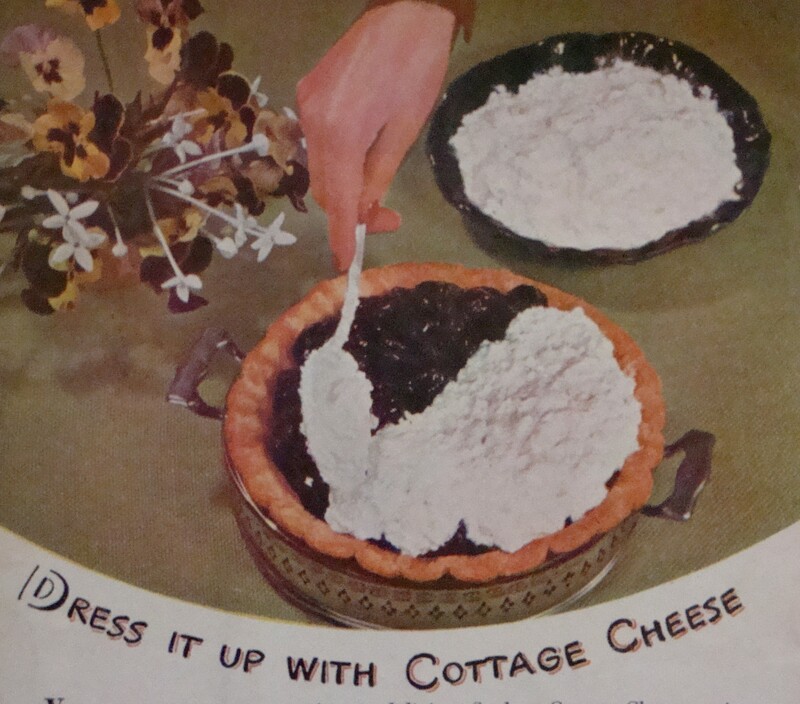 The back cover features a recipe for using cottage cheese: Prune Pie, liberally slathered with Sealtest Cottage Cheese. Yum. 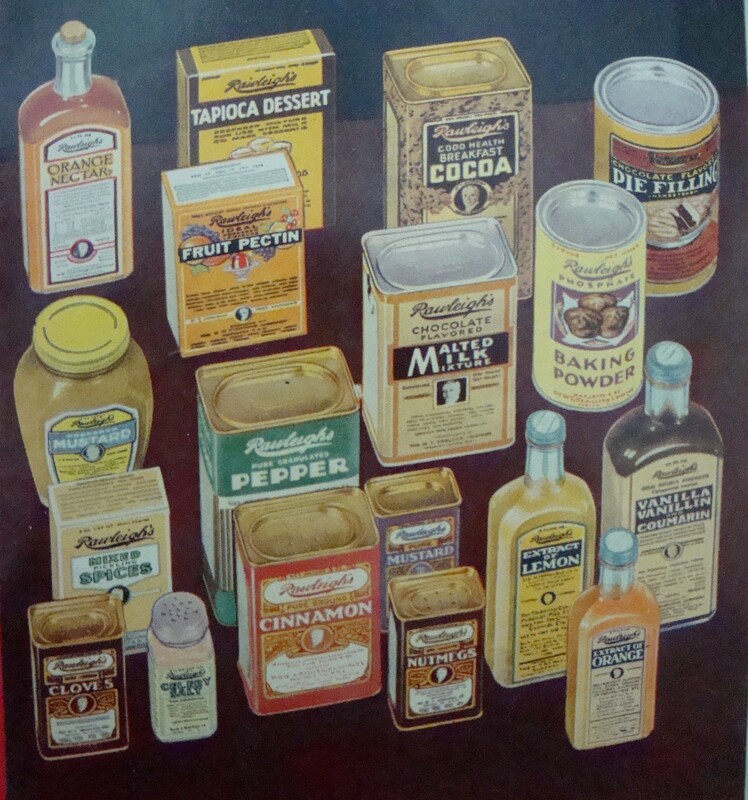 Browsing through vintage food manufacturer’s pamphlets and cookbooklets is a wonderful way to trace our food preferences and the technology of the time. It’s also very amusing! This entry was posted in Cookbooks, Cooking, Cooking and Social History, Cooking Technology, Eating, Food Trends, Recipes, Uncategorized, Vintage Cookbooks and tagged Armour Co., cookbooks, Cooking, Cottolene, food history, Furst-McNess Co., Jell-O, Kraft Cheese, Kraft-Phenix, Lea & Perrins, Rawleigh's, Sue Jimenez, Table Talk, time capsules. Bookmark the permalink. Growing up in Canada, we had some “Kraft” glasses as I recall, but I don’t recall the “swanky” glasses. I do remember Welches grape jelly glasses, though, although I’m not certain what my Mom ever did with them. Such a lot of food history! Thank you for your comment. cream spread and pineapple cream spread. She just made them into a sandwich or she would fill celery sticks with them. I have a collection of big top peanutbutter glasses. My brother got the swanky juice glasses and the 6 oz. Welches jelly glasses. .